GUEST BLOG / EDITORS OF THE CIVIL WAR TRUST--As the first streaks of dawn appeared in the eastern sky on May 16, 1863, a train heading east neared Clinton, Mississippi and found the tracks ahead destroyed. The brakeman and the baggage-master were escorted by Union soldiers into the presence of Maj. Gen. Ulysses S. Grant. 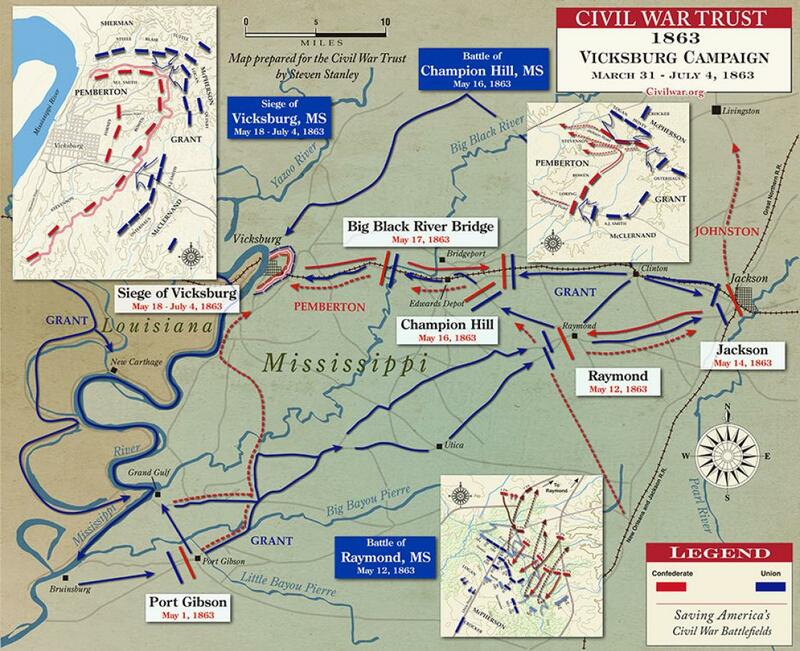 When questioned, they informed the Union commander that the Confederate army defending Vicksburg, which they estimated numbered 25,000 men with ten batteries, was in Edwards and preparing to attack the rear of Grant’s army. 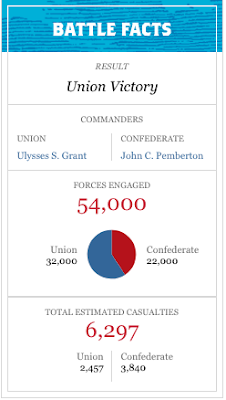 This was not a bad estimate of the Confederate army, which actually consisted of 23,000 men and 15 batteries. Grant ordered his troops, 32,000 in all, to march on Edwards along three parallel roads—one upper, one lower, and one midway between them. Although the opening shots of the Battle of Champion Hill were fired along the lower road around 7 A.M., it was not until 9:45 that the vanguard of Brig. 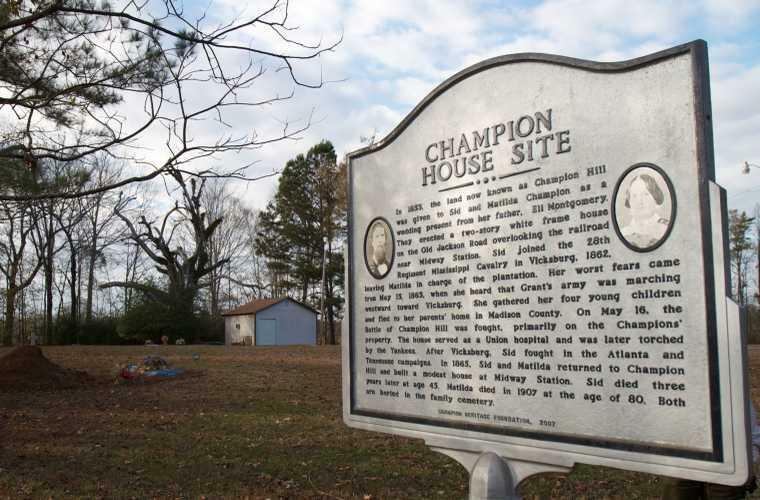 Gen. Alvin Hovey’s division turned a bend in the upper road and reached the country home of Sid and Matilda Champion. A half-mile southwest of the house was the bald crest of Champion Hill, which dominated a strategic crossroads that would be vital to the final assault on Vicksburg. On top of the hill Hovey could see soldiers clad in butternut and gray supported by artillery. These guns opened fire on the long blue column and announced that battle had been joined. 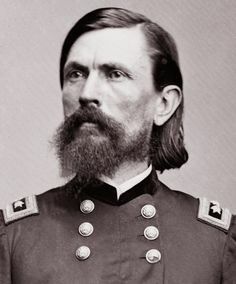 Hovey quickly swung his men into line of battle, supported by the men of John A. Logan’s division. Grant arrived on the field shortly after 10 A.M. and ordered this powerful battle line to advance. With a mighty cheer the Federals slammed into the Confederates at the base of the hill and a wild hand-to-hand brawl ensued. Union soldiers swept over the crest of Champion Hill and drove hard toward the crossroads only 600 yards farther south. Despite a murderous fire of musketry and artillery, Hovey’s division seized the crossroads and the Union army was on the verge of victory. Confederate general John Pemberton ordered a desperate counterattack by John Bowen’s Division. Around 2 p.m., with the “Rebel Yell” ringing in the air, Bowen’s Missourians and Arkansans slammed into Hovey’s men before they could consolidate their hold on the crossroads. Bowen’s rugged soldiers surged over the crest of Champion Hill and pushed the enemy back to the Champion House. Their success, however, was short-lived, as two more Union divisions charged the hill. Threatened in flank and rear, Bowen was compelled to fall back. When the Federals again seized the crossroads, victory was theirs. Brig. Gen. Lloyd Tilghman’s brigade was left behind to cover the Confederate retreat. The Federals advanced in force against Tilghman and he was mortally wounded while directing the fire of Capt. James Cowen’s Mississippi battery. 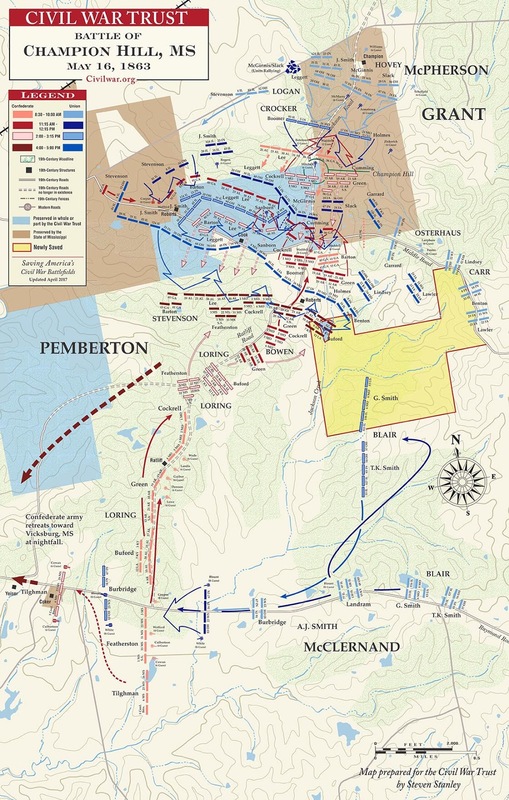 His brigade was forced from the field, but his sacrifice enabled most of Pemberton’s army to safely withdraw towards Vicksburg, with the exception of Loring’s Division, which was cut off and managed to escape southeastward to Crystal Springs. The decisive Union victory at Champion Hill was instrumental in forcing the Confederates out of the open field and into a doomed position inside the walls of Vicksburg.